HILO » Hawaii County police have ordered 450 Taser electronic-control guns that subdue a suspect with a 50,000-volt charge. The jolt locks up a suspect's muscles for up to five seconds, but when it's over, the suspect has no residual injuries, said Deputy Chief Harry Kubojiri. The device is considered safer than pepper spray, for which a suspect may need up to 45 minutes to shake off the effects, he said. Hawaii County follows Honolulu and Maui in adopting the device. 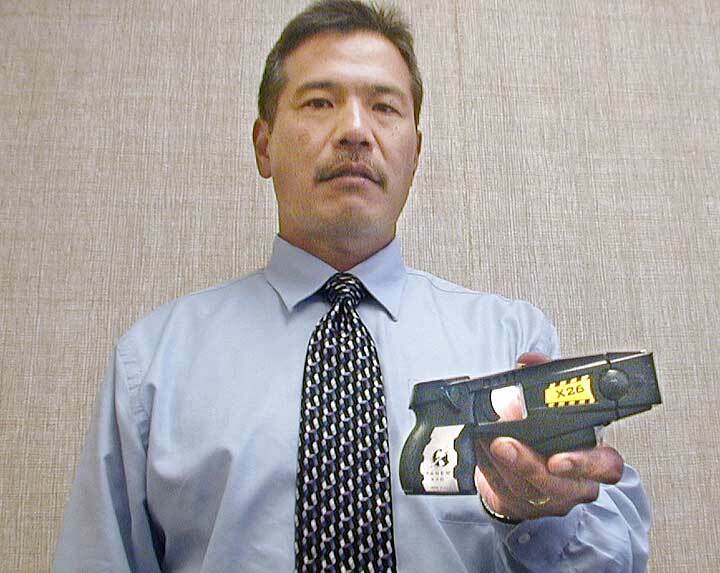 HILO » Deputy Chief Harry Kubojiri volunteered to be the first officer in the Hawaii County Police Department to be shot with a 50,000-volt Taser electronic control gun last year. "It's like getting hit with a 90-mile-an-hour fastball," Kubojiri said. Unlike a fastball, which Kubojiri knows from his baseball days, the Taser leaves no residual pain after the standard five-second jolt turns off. On Monday, police got county approval to purchase 450 of the potent little guns from Taser International Inc. Delivery will take four to six weeks, said police Maj. Jay Enanoria. The purchase price is $509,358.85. This includes spare cartridges with wires and probes, which have to be replaced after each use, plus training costs, said Assistant Chief Paul Ferreira. Such "electronic control devices" aren't new. The model Hawaii County will buy is the fourth generation of the product, Kubojiri said. Honolulu and Maui police already have them. But Hawaii County police had to clear up some issues before making the purchase. Over the years, pepper sprays used by police have been made with alcohol, Kubojiri said. An alcohol-laced spray, followed by a sustained electrical charge, could start a fire, he said. New pepper sprays are water-based. Only officers issued the new sprays will also be issued the Tasers, Kubojiri said. Studies have shown that Tasers can be used without injury even on people with pacemakers, he said. Taser guns use nitrogen gas to shoot two thin copper wires with probes topped with barbed needles. Just getting into a suspect's clothing is enough to make the electronic jolt work, but if the needles do embed in the skin, they can be pulled out, leaving only slight skin irritation, Kubojiri said. The department earlier bought 20 Tasers with a grant, meaning they will have a total of 470 for a department with only 430 sworn positions, and only 385 of those positions currently filled. Ferreira sees that as a plus, giving the department a good price for bulk buying, and spare Tasers to replace those that break and to arm new officers.